Axel has renewed its Remote Management software called the AxRM v4. This software allows administrators to easily configure Axel TCP / IP products remotely. The introduction was early in January and it has been completely renewed. For example, this version has a new interface that is compatible with touch screens. What else is new to this software? You can read it below. 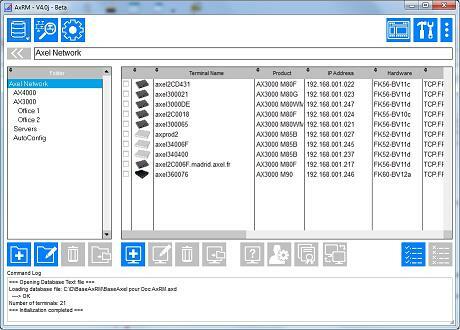 The new Axel Remote Management software can be downloaded here. Would you prefer to receive the update by For All IT? Please send an email to sales@forallit.nl and you will receive the update by mail. Below we describe the new features that brings this update. A secure SSL channel can be used for both XML administration commands and auto-configuration. – Authentication (with X.509 Certificates), a administration command issued by an unknown AxRM server can be denied by the thin client. On the thin client side, the SSL administration commands are supported by M80, M85 and M90 with firmware 1626a. Like AxRM v3, AxRM v4 supports both ‘text file’ and MS-SQL databases. In addition is also supported MySQL database. AxRM v4 offers several methods to export its database. In addition of CSV and text-file format, AxRM v4 supports also OCS format (for OCS Inventory NG utility). Furthermore, AxRM v4 can update a GLPI server. AxRM v4 for Windows X86 and Windows X64 are available online. Linux (32 bits or 64 bits) packages are available on request. The AxRAC utility, included in the AxRM v4 package, is a command-line remote administration utility. It allows thin clients to be administered from the command line or a home-made software. AxRM v4 offers all the existing AxRM v3 features and supports all Axel Thin Client models. Start immediately with the latest version? See the video below how to use the Axel Remote Management.